After the death of Charlemagne (Charles the Great) in 814 AD the Frankish Empire was faced with serious issues. The Arab conquest has made the Navy sailing dangerous and substantially reduced the supply of goods from the East. This was consequence of further reduced trade with goods in the Europe. In the Carolingian Empire Landowners were against the strengthening of the central government because they were started to play a major role in society. They controlled the courts, prevailing in the army, and from this population came most of the “grafs” (nobility) and bishops. The powers of grafs had to be monitored in particular, because they pressured the emperors’ emissaries and only a mighty ruler could control them. These problems, together with the disintegration of the Empire, or anarchy at the local government level, could not be easily stopped, and the new wave of barbarians further complicated the functioning of the central government. Louis the Pious (or Ludwig der Fromme) was successor of Charles The Great. During the reign of his father, Louis the Pious became King of Aquitaine (781-814). When he came to the throne, he dismissed all the fathers advisers who were spend to much money and so in the very beginning period some nobles moved away from him. Louis has promoted the thesis that the pope should choose or replace the emperors. That was contrary to his father’s thesis because Charlemagne did not let the church to be involved in his decisions. Decision of Louis the Pious to over-appreciation the Church has weakened his Imperial authority but the problem was also in the family with main question of who would be his successor. Namely, Louis the Pious had three sons with his first wife Ermengarde of Hesbaye: Lothair (Lothar), Pepin and Louis (Ludwig “Bavarian” or ” the German”). Louis the Pious tried to give each son part of the land, but in order to still remain a complete empire. Pepin got Aquitaine and Ludwig Bavaria, while Lothair as the oldest son was declared as a co-ruler. After the death of his father, Lothair was supposed to become a new ruler of the Holy Roman Empire. The first who was dissatisfied with such decision was Bernard, Ludovik’s nephew, but his rebellion was quickly stopped. Other family members were also not satisfied with this information because Lothair got the most in compare to his brothers. After death of his wife Ermengarde of Hesbaye on 3th October 818 , Louis the Pious married Judith of Bavaria. By his second wife, Louis the Pious had a daughter Gisela and a son Charles (later Charles the Bald). Soon after, Judith of Bavaria asked the emperor to give to Charles the part of the Empire. Family quarrels have grown into civil wars which had a beneficial effect on the strengthening of the nobility. 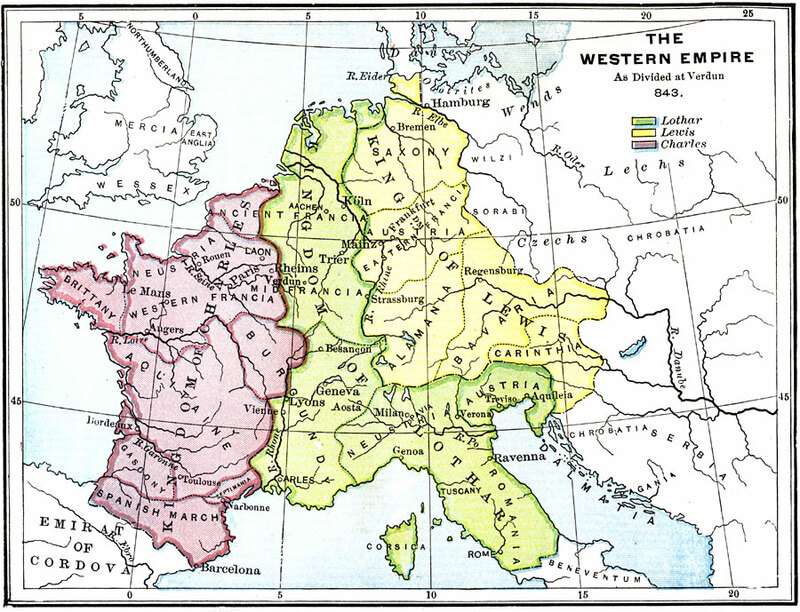 At Worms in 829, Louis gave Alemannia (territory inhabited by the Germanic tribe Alemanni from 213 AD) to Charles the Bald and that decision led to confrontation with his another son Lothair. Soon afterwards the civil war started in 830 when the other two sons Pepin of Aquitaine and Louis the German surrounded the army of Louis the Pious and finally they managed to capture him. They released their father one year later because they managed to get from him even more inheritance and also Lothair loosed the status of co-ruler. However, in 832 the family war began again and lasted next four years. The family was reconciled in 836. Louis the Pious took from Lothair (and gave to Charles the Bald) all land except of Italy. Pepin of Aquitaine and Louis confirmed what they owned previously. The more intense attacks of Normans to the borders of Holly Roman Empire impacted on brothers to stop the war between each other and finally they signed the agreement in Verdun 843. By this agreement Carolingian Empire was divided into three parts. Charles the Bald got the land west of the Rhine River, Louis the German received land east of the Rhine. Territory of the Italy and the narrow area from the mouth of the Rhine to the Rhone River was given to Lothair who kept the title of Emperor, but not the prerogative of the entire Empire. This division was based on the later states: France, Germany and Italy. The Treaty of Verdun was the first stage in the dissolution of the Carolingian Empire. The Lothair’s kingdom (Lotharingia) was weak, so the division among his sons soon led to the collapse. In 855 within Treaty of Prüm, Lothair I divided the kingdom between his three sons. 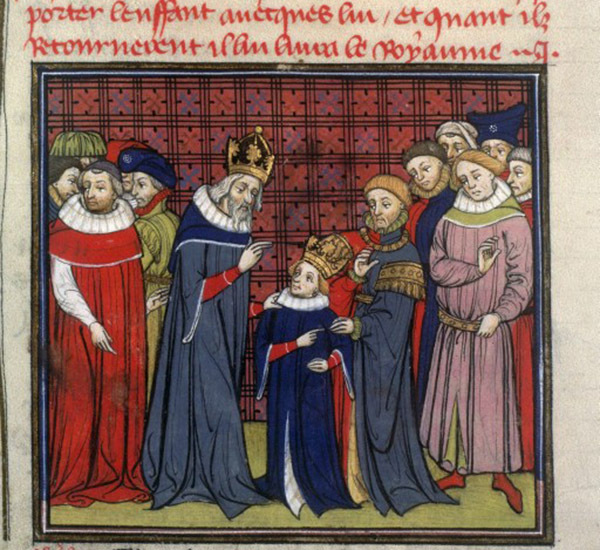 The oldest son Louis II (“the Younger”) received Italy and the title of Emperor (but during his reign, the title lost any value); Charles gained an area between the Alps and the Rhone River (the area would later become the Kingdom of Burgundy); while the Lothair II got North countries, the rest part of his father Kingdom (Kingdom of Lotharingia – today’s countries Netherlands, Belgium, Luxembourg). The territories of the Holy Roman Empire were again divided (after the death of Lothair II in 869) within the Treaty of Mersen (or Meerssen) on 8 August 870 between Charles the Bald and Louis the German. Louis II (“the Younger”) kept the territory’s given to him by the Treaty of Verdun 843. By the end of 884, there were only two legitimate successors of Charles the Bald and Louis the German. Charles III also known as Charles the Fat (881-887) was son of Louis the German and Charles III the Simple was grandson of the Charles the Bald. With the support of the nobility, Charles the Fat in 881 received crown from Pope John VIII and he became emperor of the Carolingian Empire. After several years later Charles the Fat was forced to abdicate and after that he died in January 888. After his death the Carolingian Empire fell apart on five separate kingdoms (France, Germany, Italy, North Burgundy) and two other independent dukes (Aquitaine and Bretagne in North-West France). The Church was appalled by all these disputes of the Carolingian dynasty and within all those civil wars because it reduced the revenue to the Church. In addition to civil wars Carolingian Empire was weakened due to increasing of barbarian invasions starting from beginning of the 9th century. Barbarians were primarily interested in robbery and then settling. Because of their speed of invasion, the Carolingian’s were helpless. The protection of Empire was based on local defenses by the local nobility who protected their lands on feudal property. In most cases attackers were Normans, Saracens and Hungarians.